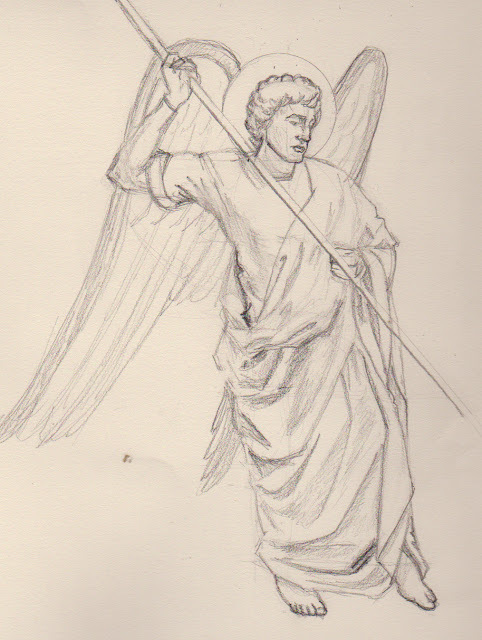 This is the third angel in the piece. I didn't give him a shield because he'll be in the background. A bit of self-critique: This is an example of why not to draw from photographs if you don't have to...it's difficult to get the proportions right when you're fighting against the lens distortion. This angel is little stocky with a long arm. On the plus side, I'm getting better at handling the drapery, working from large forms down to smaller forms and letting the folds assist the sense of movement. I managed to get a good contrapasto (weight on one leg) pose out of the model which makes the drawing just the right amount of dynamic.